A Critical Analysis of the EU-Turkey Deal on Irregular Migration: Is the EU a Successful ‘Norm Entrepreneur’? This paper studies the so-called EU – Turkey Deal, which was reached on 18 March 2016 as an attempt to provide an end to irregular migration from Turkey to Greece through the Aegean Sea. The aim of the presentation is to critically re-evaluate the EU’s international identity claims in the light of the readmission regime put into effect by the EU- Turkey Deal. The paper argues that the EU-Turkey deal on refugees has far-reaching implications for the EU’s international identity as the outcome of this initiative has a critical impact on whether the EU represents a successful ‘norm-entrepreneur’ whose actions are guided solely by normative considerations. The paper further argues that Europeanisation of migration and refugee policy significantly harms the EU’s normativity, and other international identity, claims. The article suggests that contrary to the expectations of those who promote the idea of a Cosmopolitan Europe, the EU’s common migration and asylum policy has turned into an effective tool for pressurizing neighbouring countries to adopt policies that may violate international refugee law. 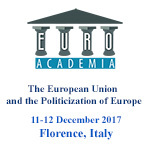 The European Union and the Politization of Europe: A Promise of Regionalisation under a New Common Roof, Caught in New Nationalism? Please, Do Not Forget Eugenio Montale!